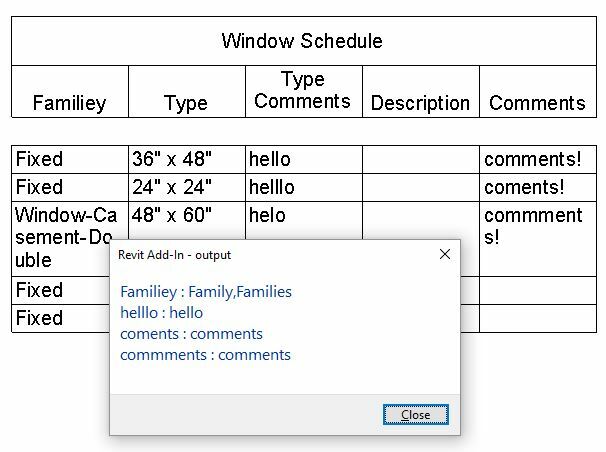 Editor's Note: As he often does around the larger Revit conferences, Harry Mattison took and granted Revit API wishes at BILT NA 2018. Wishes could be posted on Boost Your BIM or tweeted to @BoostYourBIM. They're collected here for your convenience. This one falls into the category "better late than never." This sample shows how to “Remove warning/pop-up when modifying type parameter values within a schedule” using the DialogBoxShowing event. Please remove the warning/pop-up that appears when editing scheduled fields that are tied to type parameters. This is EXTREMELY annoying when entering data for our MEP schedules. I.E. Plumbing Fixtures, Air Devices, Lighting Fixtures, etc. Currently a straight wall cannot be aligned to a curved line of reference. So in the instance where a wall was drawn straight, and doors and windows were added to it, when it needs to be modified to align with a curved gridline, for example, it will not have that option. So a new wall will need to be created and doors and windows will need to change hosts, and the original wall will need to be deleted. This is time consuming. A solution would be to allow for a straight wall to be aligned with a curved reference line. 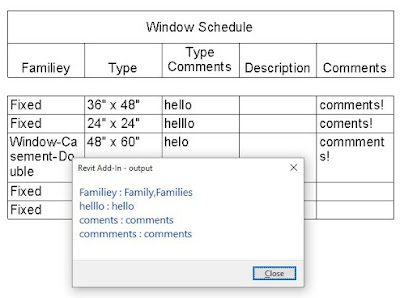 Why doesn’t Revit check spelling in schedules? No good reason that I know of, so here’s an investigation into how it might be done with the API. There’s also some discussion of JSON deserialization and communicating with the Bing Spell Check web API. It would be nice if we could right click on a specific linetype and “select all instances” in view instead of having to select everything and then filter them out.